We are professional readers offering Tarot, Palmistry and Norse Rune readings in the greater Portland area. We are available for private gatherings, company parties and public events, to offer fun but informative readings for your guest’s entertainment. Whatever size gathering you are planning, we can provide from 1-6 readers, or more, to meet your needs. Whatever the style and theme of your event, we can add to the entertainment and mood with appropriate costuming and decor. We also offer private personal readings by appointment either in our individual offices or by email, Skype or telephone. Please explore our site to see more about what we have to offer, see photos and read testimonials from our wonderful clients. We look forward to hearing how we can be of assistance to you! Call: 503-327-5084 or Book Online Now! And, lots of private Birthdays, Graduations, Bachelorette, Halloween, New Year, and other parties! “Portlandia Fortune Tellers offered readings of tarot, palm and runes for our corporate holiday party and the event was a grand success. They added a special flare to our cirque themed party by dressing the part in gypsy attire and guests were overjoyed by such insightful readings. 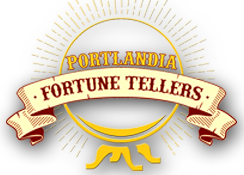 I would highly recommend Jadzia and Jay for any party or group event if you want an element of entertainment value with a skilled professional.” ~ Melissa at Nike, Inc.
©2019 Portlandia Fortune Tellers. All Rights Reserved. Bakes and Cakes by Rara Theme. Powered by WordPress.